What is it? Distal biceps rupture is when the tendon attaching the biceps muscle to the elbow is torn from the bone. This injury most commonly occurs in middle-aged men during an episode of heavy lifting. What are the symptoms? When the distal biceps tendon ruptures, it usually feels like a painful pop directly in front of the elbow. The initial pain often subsides quickly with the subsequent development of swelling and bruising in front of the elbow. The arm often feels weak with attempts to bend (flex) the elbow or rotate the forearm into the palm up position (supination). The distal biceps tendon sometimes tears only part of the way resulting in persisting pain in the front of the elbow when the arm is used. Do I need any further investigations? Complete rupture of the distal biceps can usually be diagnosed on examination of the elbow. The findings include absence of the tendon on the front of the elbow and loss of strength in both flexion and supination. Tests such as ultrasound or magnetic resonance imaging (MRI) scans can helpful in certain cases to see if the biceps tendon is only partially or fully torn. What are the non-surgical treatment options? Distal biceps ruptures can be treated without surgery but this will result in permanent loss of strength in elbow flexion and supination. Generally therefore most patients opt to proceed with surgery and nonsurgical treatments are usually only used for people who do minimal activities and require minimal arm strength. What does surgery involve? Surgery for complete ruptures should ideally be performed within 2-3 weeks of the injury. Beyond this point the tendon recoils further up the arm and scars into the abnormal position making the procedure more difficult and the results less predictable. A small incision is made over the front of the elbow. The ruptured free end of the biceps tendon is retrieved and the damaged and degenerated end is trimmed. Sutures are then crisscrossed through the bottom inch of the tendon, which is attached to a small button (Endobutton). The original attachment on the radius (radial tuberosity) is drilled to create a hole for the tendon end. The button is then passed through the hole and flipped so that it is secured on the back of the bone. What is the success of surgery? Generally, this is a safe and reliable operation to reattach the tendon to the bone, restore the contour of the biceps and the strength in the elbow. What are the potential risks of surgery? Any surgical procedure carries risks, however every effort is made to minimise these to ensure the best possible outcome from your surgery. The commonest risks of surgery include infection, nerve injury, elbow stiffness and failure of tendon healing. A stretch to the nerve supplying sensation to the thumb side of the forearm is very common and generally resolves by 3 months post surgery. What is the recovery after surgery? You will be given a sling to wear for the first couple of weeks after surgery. You can begin moving the elbow gently from day 1. You will usually be seen in clinic two weeks after surgery to check the wound and be given some general advice about recovery. 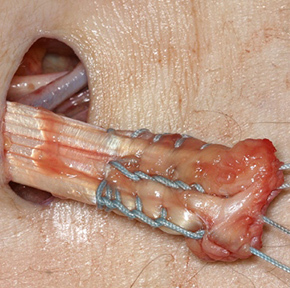 There are no sutures to be removed as they are buried under the skin. For the first 6 weeks after surgery you can gently work on regaining range of elbow motion. During this period the arm can be used for simple activities of daily living but avoid any heavy lifting. At 3 months, the tendon repair is strong enough to begin strengthening and resistance exercises. When can I return to normal activities? Return to work depends on the nature of the job. You can return to desk and computer work when you feel comfortable to do so. If you have a heavy manual job then it will be at least 3 months before you can safely return to work. You may return to driving when you feel safe to control the vehicle, which will usually be a few weeks after surgery. What is it? Elbow arthritis is degenerative wear of the elbow joint that can cause pain and stiffness. 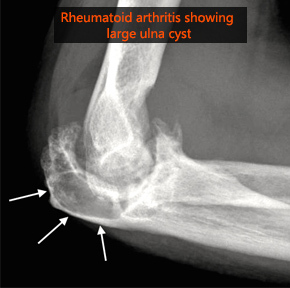 The two main forms are osteoarthritis and rheumatoid arthritis. 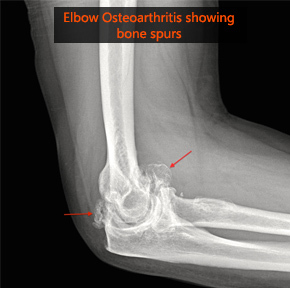 Osteoarthritis is characterised by the formation of bone spurs in the elbow joint in addition to thinning of the cartilage lining. Typically there is no obvious cause although heavy manual work or a previous injury may predispose to this condition. In rheumatoid arthritis the patients’ own immune system mistakenly attacks the joints causing inflammation and damage. What are the symptoms? Pain, stiffness and swelling are the main symptoms of arthritis of any joint. At first, the pain is related to activity. As the condition worsens, you may feel pain even when resting, which may interfere with sleep. Gradual loss of elbow motion leads to decreased function, which may have an impact on activities of daily living. Will I need any further investigations? X-rays are required to look for wear of the joint space and for the presence of bone spurs (osteophytes). CT scans give a 3-D view and allow for a more detailed assessment of the size and location of bone spurs. This information is very useful when planning surgery to remove the spurs. What are the non-surgical treatment options? Initially, pain medication and anti-inflammatory drugs (such as ibuprofen) may be helpful to help control swelling and pain. It is sensible to modify or limit your activities with the arm to reduce the load on the elbow. Cortisone injections into the elbow joint may provide some temporary relief. What does surgery involve? There are a number of different surgical options that depend upon the severity of the condition and your level of function. Arthroscopic debridement This involves keyhole (arthroscopic) surgery to see inside the elbow joint, remove bone spurs / loose fragments and release the scarred lining of the elbow joint. Open debridement If the arthritis is much more advanced, there is severe loss of elbow motion or the bone spurs are very large, then it may be more appropriate to perform an open procedure. Elbow joint replacement Elbow replacement is a last resort and is reserved for a very small group of patients. These include patients with severe rheumatoid arthritis and less commonly osteoarthritis. The worn joint surfaces are removed and artificial components are inserted. Due to risks of wear and loosening of the prosthetic joint, patients must be willing to accept low levels of activity involving the elbow. What is the success of surgery? More than 80% patients will achieve a better range of movement and significant improvement in their pain after debridement of the elbow. The surgery however does not remove the arthritis process and therefore it is possible that with time the symptoms may return. 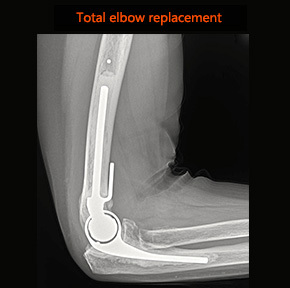 Elbow replacement is typically very effective in providing a pain free elbow with a good functional range of movement. What are the potential risks of surgery? Any surgical procedure carries risks, however every effort is made to minimise these to ensure the best possible outcome from your surgery. The commonest risks of surgery include infection, bleeding, and failure to fully cure the problem. The close proximity of several nerves that cross the elbow make nerve damage an additional particular concern with surgery on the elbow joint. The risks with an elbow replacement relate the artificial nature of the joint; in particular, wear and loosening of the components that may require redo surgery in the future. What is the recovery after surgery? Recovery very much depends on what surgery is performed. You will see a physiotherapist prior to discharge and as an outpatient to show you exercises and guide your recovery. The use of an ice pack on the elbow may also be helpful for the first few days after surgery. You will be seen in clinic around two weeks after surgery to check the wounds, remove sutures (if necessary) and assess recovery. Arthroscopy The advantage of arthroscopy is that no muscles have to be detached to carry out the surgery and therefore restrictions are minimal afterwards. You can begin moving the elbow with light activity from day one of the surgery. It is important to keep the elbow moving to prevent it re-stiffening. Open debridement Swelling and bruising after open debridement is usually greater than after arthroscopy because it is more invasive. However it is important to keep the elbow moving as much as possible. Elbow joint replacement After surgery the elbow if immobilised in a plaster slab for 48hrs to allow the tissues to settle. The plaster is removed at this point and gentle motion is commenced. It is important to avoid straightening the elbow against resistance (such as pushing out from a chair) for the initial 6 weeks after surgery whilst the repaired tissues are healing. When can I return to normal activities? Return to work depends on the nature of the job. You can return to desk and computer work when you feel comfortable to do so but avoid any manual work, heavy lifting or sporting activities for 4-6 weeks. You may return to driving when you feel safe to control the vehicle, which is usually about 10-14 days after surgery for a debridement procedure but at least 6 weeks for an elbow replacement. Restrictions are greater following elbow replacement and generally speaking any heavy activity with the elbow should be avoided permanently. What is it? Injuries and fractures to the elbow are common. The elbow may fracture or dislocate after a fall onto an outstretched arm, a direct impact to the elbow, or a twisting injury. What are the symptoms? Immediate pain is felt around the elbow. The elbow will frequently swell and bruise. 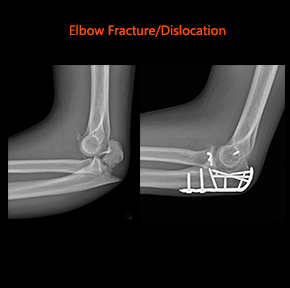 The shape of the elbow may be abnormal if the fracture is significantly displaced. Sometimes patients also sustain a wound over the fracture whereby the bone has punctured the skin (open fracture). Open fractures are treated urgently to minimise further soft tissue damage and risks of infection. What are the non-surgical treatment options? Provided that the bones have not moved significantly out of position, then it is likely that you will be treated with pain medication and given a sling to initially rest the elbow. Elbow motion will usually be commenced soon (days to weeks) after the injury as pain allows. What does surgery involve? 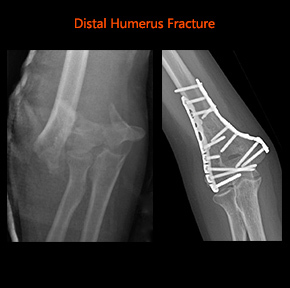 In the situation that the bones have moved significantly out of position, then surgery may be necessary to realign the position of the bones and secure them in place with screws and plates. This should allow you to commence elbow motion shortly after surgery to minimise stiffness. What is the success of surgery? The aim of surgery is to regain functional range of motion and strength. It is likely that some range of motion is lost. Recovery can take a long time depending on the nature of the injury and complexity of the surgery. What are the potential risks of surgery? Any surgical procedure carries risks, however every effort is made to minimise these to ensure the best possible outcome from your surgery. The commonest risks of surgery include infection, nerve or blood vessel damage. The elbow is particularly susceptible to getting stiff following fracture and subsequent surgery and it is very common to loose some of the range of motion. As with any fracture in the body, there is a chance that bones fail to heal. Occasionally the implants that are used to reconstruct the elbow cause problems and need to be removed at a later date. What is the recovery after surgery? There will be an adhesive dressing over the wound, which can usually be left undisturbed until your follow-up appointment at around 2 weeks. Elbow motion will usually be commenced in the first few days after the surgery with guidance from a physiotherapist. You will be seen in clinic two weeks after surgery to check the wound and assess recovery. What is it? A bursa is a thin, slippery sac that acts as a cushion between bones and soft tissues. 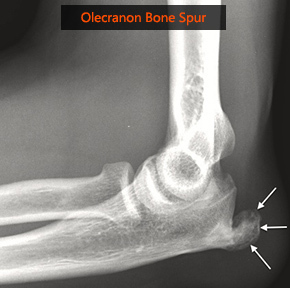 The olecranon bursa lies between the loose skin and the pointy bone at the back of the elbow called the olecranon. Normally the olecranon bursa is flat but if it becomes irritated or inflamed (bursitis), more fluid will accumulate in the bursa and bursitis will develop. Often there is no clear cause although it may be related to an injury or repetitive irritation such as leaning on the elbow. The presence of a bone spur in this area may be a contributing factor. Systemic diseases such as gout and rheumatoid arthritis can be associated with olecranon bursitis as well. What are the symptoms? 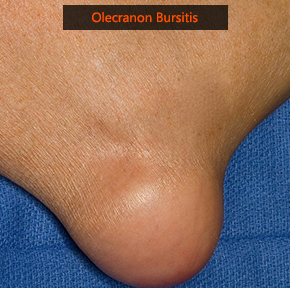 Olecranon bursitis results in a variable sized swelling which can develop quickly or over time. Most of the time the swelling is not painful unless it gets knocked. It can become infected with bacteria leading to increased pain, tenderness, redness and warmth in the area and symptoms of fever. In this situation you may need see your local doctor urgently or attend the hospital. Will I need any further investigations? Olecranon bursitis is usually diagnosed on history and examination findings. An x-ray is required to look for associated bone spurs. More specialist tests such as ultrasound or MRI scans are occasionally needed if the diagnosis is not clear. What are the non-surgical treatment options? Most patients with olecranon bursitis will get better without surgery. A compressive dressing may help to decrease fluid accumulation and an elbow pad may also be used if the area is getting irritated from leaning on the elbow. If this is unsuccessful, aspiration (removal of fluid by needle) may be tried. What does surgery involve? Surgery is sometimes necessary to remove a thickened bursa that has not improved with any other treatment. Surgical removal is usually done because the swollen bursa is restricting your activity or is painful. An incision is made over the swelling, which is then carefully removed as well as any underlying bone spur. The wound is closed with sutures and a compression bandage or plaster splint is applied. What is the success of surgery? Generally, this is a safe and reliable operation to remove the swelling although occasionally the swelling can return. What are the potential risks of surgery? Any surgical procedure carries risks, however every effort is made to minimise these to ensure the best possible outcome from your surgery. The commonest risks of surgery include infection, bleeding, and wound healing problems. There is also a risk that the swelling can return in the future. What is the recovery after surgery? If the swelling that was removed was very large, then it is important to rest the soft tissues as the wound heals. This may require a period of immobilisation for a week or two in a plaster slab. After this you can begin gently moving the elbow with light activity. The range of motion in the elbow will gradually return and physiotherapy is not usually required. You will be seen in clinic between one and two weeks after surgery to remove sutures and assess your recovery. When can I return to normal activities? Return to work depends on the nature of the job. You can return to desk and computer work when you feel comfortable to do so but avoid any manual work, heavy lifting or sporting activities for 4-6 weeks. You may return to driving when you feel safe to control the vehicle, which is usually between one and two weeks after surgery. What is it? 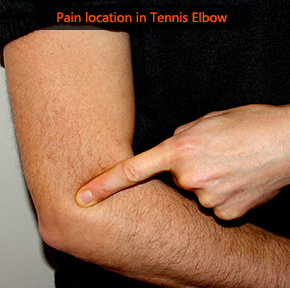 Tennis elbow (lateral epicondylitis) is the most common painful condition of the elbow. Pain occurs on the outside of the elbow at the bony prominence known as the epicondyle, where the muscle/tendons of the forearm and wrist attach. Golfer’s elbow (medial epicondylitis) is a similar less common condition that causes pain on the inner side of the elbow. Despite the names, the conditions are rarely caused by golf or tennis. The pain is caused by repetitive damage and degeneration of the muscles/tendons of the forearm and wrist at their attachment site on the bone. What are the symptoms? The pain and tenderness around the outside (tennis elbow) or inside (golfers elbow) of the elbow is aggravated by activities that involve gripping and movements of the wrist. Sometimes the pain is referred further down the forearm. Will I need any further investigations? Tennis and golfer’s elbow are usually diagnosed on history and examination findings. An x-ray may be required to exclude other causes of a painful elbow. More specialist tests such as ultrasound or MRI scans are occasionally needed if the diagnosis is not clear. What are the non-surgical treatment options? Simple splinting and physiotherapy may relieve the discomfort in early and mild cases. More resistant cases may respond to a steroid injection into the affected area. One of the latest treatment options developed for the treatment of tennis elbow is the injection of platelet-rich plasma (PRP): instead of steroids, the patient’s own platelets (blood-clotting cells) and growth factors are taken from their own blood, concentrated in a centrifuge and injected into the diseased tendon. A small proportion of patients will not respond to the above treatments and may require surgery. What does surgery involve? Surgical treatment for tennis elbow can be performed by either open (via a small incision) or arthroscopic (keyhole) techniques. 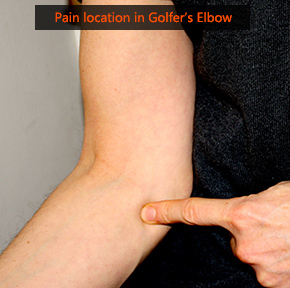 Golfer’s elbow surgery is carried out through a small open procedure. Both involve release of the affected muscle/tendon insertions from the bone and removal of the abnormal tissue. What is the success of surgery? Generally, this is a safe and reliable operation to relieve your symptoms. The success rate with surgical treatment is around 80-90% although it may take several months to feel the full benefit from the surgery. What are the potential risks of surgery? Any surgical procedure carries risks, however every effort is made to minimise these to ensure the best possible outcome from your surgery. The commonest risks of surgery include infection, bleeding, scar tenderness and failure to fully cure the problem. What is the recovery after surgery? After 2-3 days the bandage around the elbow can be removed and you can begin gently moving the elbow with light activity. Excessive elbow movement should be avoided for the first 2 weeks as the wound is healing. There will be an adhesive dressing over the wound, which can usually be left undisturbed until your follow-up appointment at around 2 weeks. You will be seen in clinic two weeks after surgery to check the wound and assess recovery. There are no sutures to be removed as they are will dissolve under the skin. When can I return to normal activities? Return to work depends on the nature of the job. You can return to desk and computer work when you feel comfortable to do so but avoid any manual work, heavy lifting or sporting activities for 4-6 weeks. You may return to driving when you feel safe to control the vehicle, which is usually about 10-14 days after surgery. What is it? 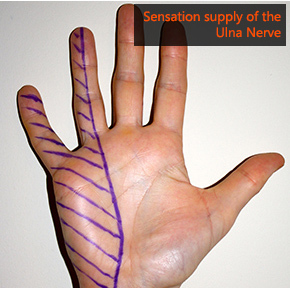 The ulna nerve travels from the neck, around the elbow through a tight space (cubital tunnel) into the hand. In the hand the nerve provides sensation to the ring and little fingers and controls most of the little muscles in the hand that help with fine movements. Compression of the ulna nerve at the elbow leads to symptoms of pins and needles, numbness and weakness in the fingers and hand. In most cases there is no obvious cause although people with elbow arthritis or previous elbow trauma are more likely to develop cubital tunnel syndrome. What are the symptoms? Most patients report numbness and tingling in the ring and little fingers, which may be worse with the elbow bent and at night. Pain and achiness on the inner side of the forearm may also be present. More severe cases can result in muscle wasting, weakening of the grip and difficulty with finger coordination. Will I need any further investigations? Cubital tunnel syndrome can usually be diagnosed on history and examination findings although electrical tests (nerve conduction studies) are often performed to confirm the location and severity of compression. What are the non-surgical treatment options? Occasionally very mild symptoms improve spontaneously. Splints that keep the elbow straight at night may help in mild cases but are of little benefit in longstanding cases. Medication and other non-surgical treatments are generally ineffective at reducing symptoms. What does surgery involve? This short procedure is carried out under general anaesthetic. A small incision is made on the inside of the elbow and the tight tissue is released to relieve the compression of the nerve within the tunnel. Very occasionally, the nerve is found to flip around to the front of the elbow (subluxing nerve) in which case it may be necessary to move (transpose) the nerve to a pocket of tissue in a more forwards position. The wound is closed with absorbable sutures and a dressing and soft bulky bandage applied. What is the success of surgery? Generally, this is a safe and reliable operation to relieve your symptoms. 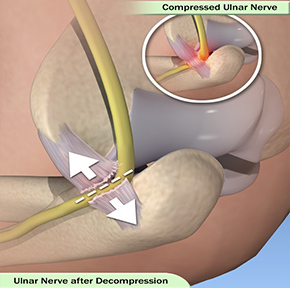 However, it is important to be aware that if the nerve has been badly compressed for a long time, recovery will take longer and occasionally may be incomplete. In this situation surgery should at least prevent the problem from getting worse. You can go home on the same day as the operation. After 2-3 days the bandage can be removed and you can begin gently moving the elbow with light activity (physiotherapy is not required). Excessive elbow movement should be avoided for the first 2 weeks as the wound is healing. There will be an adhesive dressing over the wound, which can usually be left undisturbed until your follow-up appointment at around 2 weeks. You will be seen in clinic two weeks after surgery to check the wound and assess recovery. There are no sutures to be removed as they will dissolve under the skin. When can I return to normal activities? Return to work depends on the nature of the job. You can return to desk and computer work when you feel comfortable to do so but avoid any manual work, heavy lifting or sporting activities for 4-6 weeks. You may return to driving when you feel safe to control the vehicle which is usually about 10-14 days after surgery.